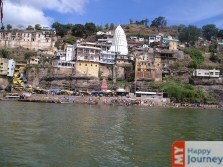 Situated in Madhya Pradesh, the renowned Hindu temple, Omkareshwar is a prominent shrine of Lord Shiva. Extended over the islands of Mandhata, the temple is built on the great river Narmada. It is considered to be one amongst the 12 enshrines of lord Shiva’s Jyotirlingas temples in India. The best part of this temple is its architecture, which is unique in the world. It represents the shape of Om symbol of Hindu religion. With beautiful artworks of its craftsmen on its walls and paintings, the structure houses two beautiful idols of Shiva. One of which depicts the name of "OM-maker-lord", whereas the other icon is of Lord Amareshwar, who is considered to be the lord of immortals. For visitors who are inclined more towards spiritual side, this place is full of ecstasy for them. The splendid carvings and statues of the divine deity empower a person, while bringing real harmony and freshness in their thoughts. Apart from its ancient architecture the scenic beauty of this place has always enhanced its charm. Due to its nearness to the river, the climate here is always pleasant and refreshing. While your visit to this holy place you can plan to indulge in shopping, as there are many shops surrounding the temple and across the streets. You can purchase local handicrafts, Shiva’s idols and other religious items made of silver, gold, wood and marble, which are available at a reasonable cost. Moreover, due to its well connected roads and transportation facilities one can easily reach this place.